New York Bridal Week’s biggest trend was Frozen. 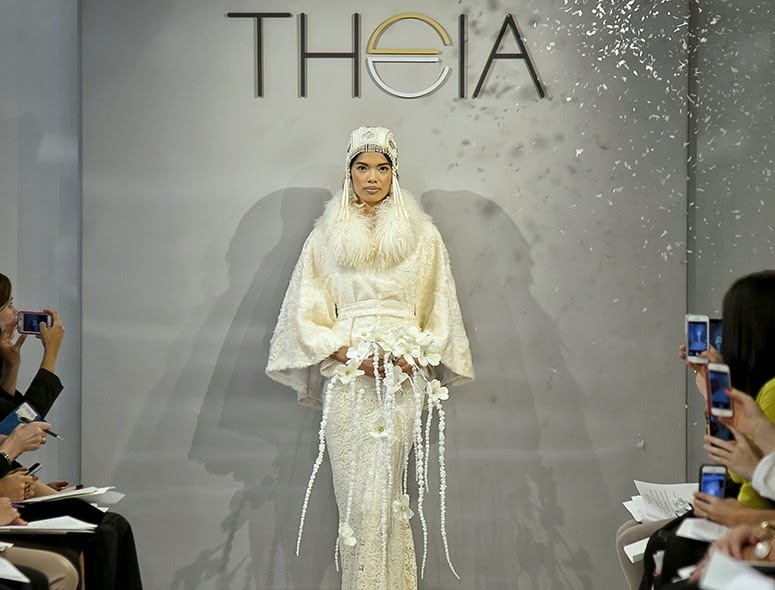 While other designers took it from the Disney movie, THEIA’s Don O’Neill took his inspiration literally, as in the frozen tundra of Mongolia. Why Mongolia? 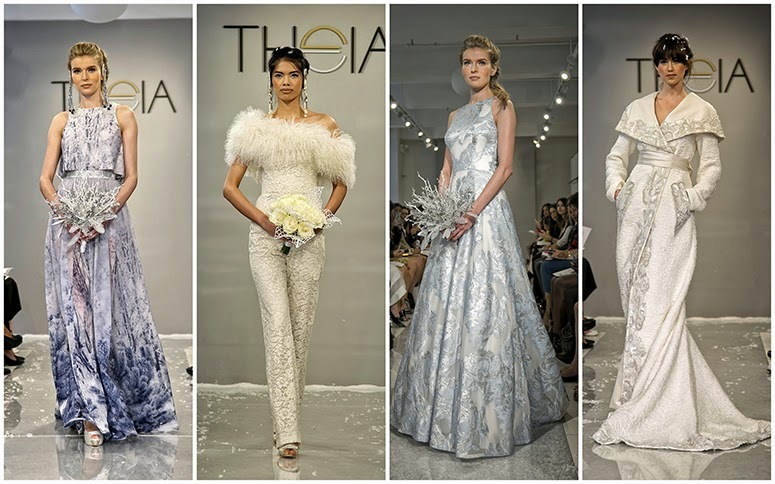 For Theia’s bridal fall 2015 collection, the designer worked with socially responsible cashmere supplier Naadam, who worked with nomadic tribes in the country to produce a unique gown for the show. In a beautiful collaboration of two cultures, the dress was hand knit in Mongolia, but using traditional stitches from Don’s Irish heritage. The distinct texture of Mongolian lamb was also used as a poncho. One of the gowns had the colors and pattern of a winter spruce landscape. Other dresses had crystal and mirrored pailette embroidery that had the effect of glittering snow. Disney’s “Elsa” could only wish for this wardrobe. Theia was inspired by the myths and Goddesses of Europe long before the animated movie hit the theaters. What I like about Don O’Neill’s approach to bridal, is that he thinks outside of the traditional wedding style box and takes more of a high fashion approach. There was a slim jumpsuit paired with a wrap, a crop top with a ballgown skirt or woven ribbon tweed full length coat as an option. The gorgeous bouquets also had a frozen flora look to them to accompany the runway looks. The flowers were created by Fleur de Pascal. 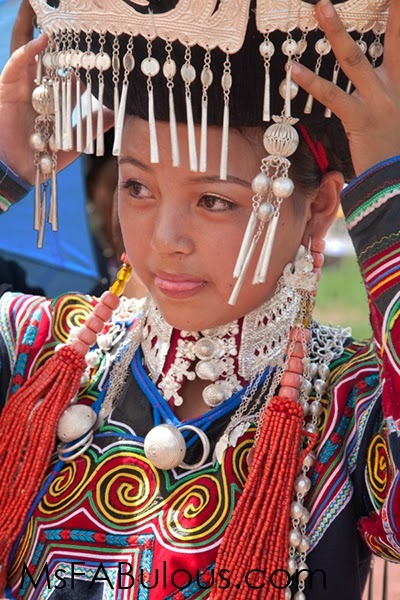 The models’ beaded hairpieces had the look of dripping icicles, but the dangling charm details have their roots in the garb of Asia's ethnic tribes (check out my Dad’s photo of a girl from the Yi tribe). Thank you Don and THEIA for another gorgeous show! Thanks again Mariana for featuring my post from the NY fashion week! Hope to collaborate again. Cheers! LOVING the last look - it's very snow princess!! Isn't it? I love winter weddings! I love the lace dress and the metallic make-up!